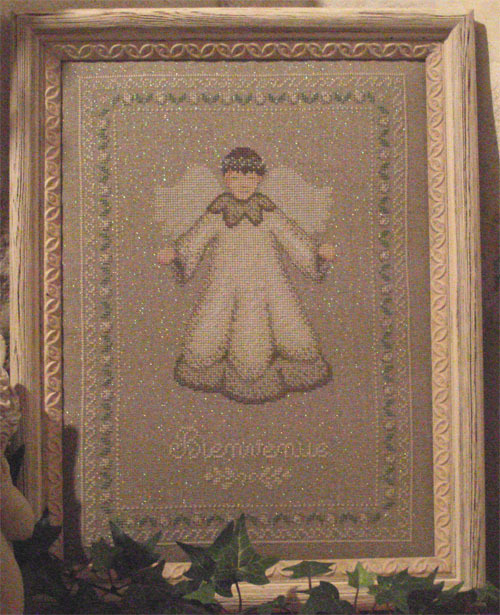 "Welcoming Angel" is a coloured cross-stitch chart (very easy to follow) with instructions translated in English. The text of the design has been translated to allow you to stitch it in French or in English ("Welcome" and "Merry Christmas"). The fabric used by the designer is available in the "related products" section below. Special stitches: This is a pure cross-stitch design with a few back stitches. The model on the picture has been stitched on a 32 count linen fabric (Zweigart Belfast colour "Natural irisé" n°11) using two strands of cotton over two threads of fabric. Recommended Fabric: 32 count linen fabric or 16 count Aida (Zweigart colour ref "Natural irisé" n°11 or equivalent), dimensions 40x50cm (16x20 in). This product is a coloured chart + instructions translated in English.